Make these two adorable Sweetheart Bunnie's for a great addition to a nursery or child's bedroom. 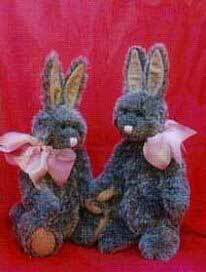 The two bunnie's are made out of gray fur fabric but you can create them out of a different color to match bedding or a crib set. Use these detailed instructions and get started.